Indrė Šerpytytė, Pedestal, Square Gathering, 2016, ink on vinyl and Dibond, 78 × 96”. Indrė Šerpytytė’s current body of work here is made up of photocollages and sculptures, exhibited on the gallery’s ground floor and in its basement, respectively. 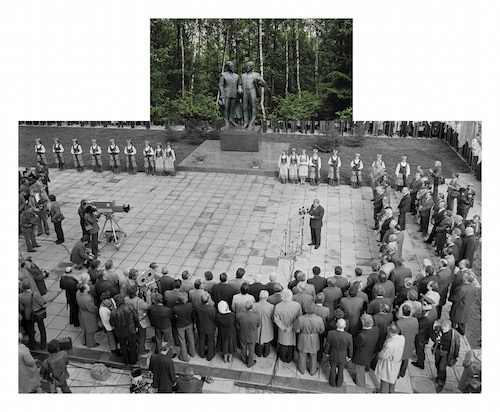 Her “Pedestal” collages (all works cited, 2016) depict statues of Lenin and Stalin in Lithuania’s Grūtas Park, a sculpture garden filled with decrepit Soviet-era monuments. Šerpytytė’s photographs of these dead symbols offer up an uncanny beauty, as we try making sense of these proud and pompous figures standing against backdrops that are lush and verdant. The artist juxtaposes her color photographs with archival black-and-white images of these works—being celebrated by cadets, politicians, and ordinary citizens—when they appeared in public squares all throughout the USSR. These compositions are accompanied by a recording, Toppled, 2016, which describes how the statues were pulled down after the fall of the USSR. The passage of time in these works—so strange, so haunting—is heightened by the narration. Downstairs, the sculpture series titled “Orders” is composed of small, black, and mostly rectangular granite blocks, set on ready-made plinths executed in the same material. The works are seductive, with their polished surfaces, sharp geometric forms, and historical nods to Constructivism or Suprematism. But they are queasy things, too, as they also call to mind headstones and other kinds of memorial sculpture . . . markers of ideologies and horrors that still haven’t been entirely put to rest.